This is a good lead in to what today’s main article will be about. At noon today [EST], I plan on talking about how to decide on what family/character to root for. And that’s kind of what this image here represents. In the heat of March Madness, a Game of Thrones versions of a bracket floated around, and I decided to fill one out. My top eight were Cersei Lannister, Khal Drogo, Tyrion Lannister, Renly Baratheon, Eddard Stark, Robert Baratheon, Daenerys Targaryen, and Sandor Clegane. 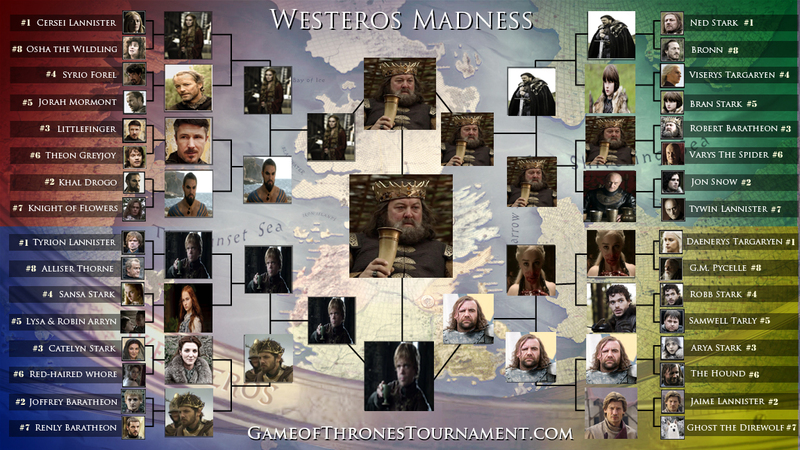 Obviously you see that Robert Baratheon won. More justification in today’s later post.